Career Insights: What Does a Salesforce Developer Do? Welcome back to another installment of our career insights series, where we take an in-depth look into some of the most well-paying and interesting careers a freelancer can do. Today, we’re looking at the role of Salesforce Developers. Find out what they do, what certifications you need to become one, and just how much more these specialised developers earn than the everyday worker. Salesforce is a CRM platform hosting a group of technologies that support the development of other technologies on top of it, from building full-scale apps and software to developing a simple web page. It features a wide range of tools from app analytics to B2B marketing solutions, and comes with many benefits including data security, testing and more. A Salesforce developer will be working on the Salesforce platform, but as Salesforce is such a varied topic, the responsibilities of a Salesforce developer can also be massively varied. What Do I Need to Learn to Become a Salesforce Developer? Salesforce is an extremely vast topic in which one can specialise, but the good news is that because of this, anyone can build up at least some proficiency in the platform in a short period of time. Many Salesforce developers will start off with a basic knowledge of developing, and may also already be Salesforce Administrators. Salesforce Administrators are required to have a broad knowledge of the platform and how to manage applications within the software, making this a good base point from which to start. Do I Need A Salesforce Developer Certification? It is recommended that you get Salesforce Developer certification if you want to pursue this as a serious freelance career. Salesforce even have their own education centre - Salesforce University - to help people become certified on the platform. The Platform App Builder certification is targeted towards developers who have experience in developing custom applications on Force.com platform (Salesforce’s very own developer platform). Having this certification will prove that you are comforting with the Lightning app builder, and that you are experienced in the declarative part of Salesforce. The Platform Developer I certification is ideal for developers with 6 months - 1 year experience developing applications on any platform. Ideally, you should also have 6 months+ of experience using the Force.com platform. This certification will show you are proficient in building custom apps on the Force.com platform, and that you can also use Apex and Visualforce on the SaaS side of Salesforce. You must first be a certified Platform Developer I before getting this certification. This certification is for developers with around 2 - 4 years of experience of a developer, and a minimum of 1 years’ experience on the Force.com platform. People who have this certification will typically have mastered Apex and Visualforce on Salesforce, and will also be fairly proficient with the SOAP, Heroku, and Lightning components of the platform. Salaries: What does a Salesforce Developer earn? According to PayScale, a Salesforce Developer can earn an average of $81,987 per year. What's’ more, according to Glassdoor, Salesforce Developers earn an estimated $22,000 more than web developers per year. The average hourly rate amongst freelancers listed with Salesforce as a specialty in our freelancer directory is $81/ hour (Freelancermap freelance rate index September 2018). That means for a regular 8-hour day, Salesforce experts would be doing $648 / day. We wanted to learn more about being a Salesforce Developer from an expert in the field, so we reached out to Winder Alejandro Ojeda, a computer engineer who has been working with Salesforce for the last two years. Winder works remotely developing solutions on Salesforce using Apex, Visual Force or Lighting Components and complete integrations from Salesforce with other applications. Today we’re pleased to have him on the blog, so don’t miss his insights about the Salesforce universe! What is your background and how long have you been working with Salesforce? I have been working in the Salesforce world for about two years. Salesforce is a huge universe, so saying that I have worked in every aspect of this universe would be a lie. However, thanks to my client’s needs and my work, I can say that I have explored several of the most common topics within Salesforce. I’ve worked as Salesforce Admin, creating and modifying objects, but also with object management, validation rules, workflow rules, Process Builder, page formats, assignment rules, duplicate rules, vacation settings, Web2Lead, Email2Lead, email templates or management of static resources, among others. In terms of Salesforce Development, I have been involved in the development of pages with Visualforce and their controllers, classes, triggers, batch, programmed processes and of course, unitary tests since these are necessary tests to verify the correct functioning of classes and triggers that are used within a project. Lately, I have been involved in projects in which Einstein Analytics is heavily used, so in a nutshell, I have been working around several aspects of Salesforce and surely many others that I haven’t mentioned. At the beginning of any working day the first thing I do is to check my business email and my current cases report. This step is necessary to see if there are any new client requests or answers, and also to know at which point are all my cases so I can plan my day. What cases am I starting with? What cases can be forwarded? Do I have any questions that need to be discussed with the team? Around mid-morning we have a team meeting, where we talk about the cases each team member has right now. If any of them present difficulties, they will be discussed with the team. We help each other so that the requirement can be completed, and the case continue its development. After the meeting begins the work; ideally we start with the requirements that are almost completed, so that we can check off a box and if necessary, ask the client to validate the functionality on their end. If the client validates the functionality, we can proceed to the productive environment. Here is where the client will use the functionality in his daily basis business. In your opinion, what are skills a great Salesforce developer needs? There are a set of non-technical and technical skills. Within the non-technical skills I will include great communication. It’s important to listen to the client to understand in-depth what they really want. Confidence and openness are also very important skills for Salesforce developers. You have to trust your know-how and experience also to be able to tell the client that the solution they have in mind is not an option, or to let them know that if it’s even feasible, it will require more time to be completed. On the other hand, you will need a set of technical skills such as knowing and understanding the object-oriented paradigm and have experience in some programming languages such as Java or C#, as well as SQL knowledge. You need to understand what a class is, what attributes are, and what an interface is. All of these are fundamental concepts to develop within Salesforce. Knowing the limits within which Salesforce works is also really important to be a good Salesforce Developer. Usually, when you develop outside of Salesforce, you work with tools that don’t present those limits, whereas in Salesforce you’re working in an environment shared with other users; these limits help you to use the platform optimally. For example, you cannot make more than 100 SQL queries in a transaction - ideally you will use maps to collect all necessary information within a loop and then make a single SQL operation to avoid this limit. It’s important to keep in mind this and many other limits when developing with Salesforce. Are certifications a must to be a Salesforce developer? No, you don’t need them but if you hold these you’re got tangible proof that you really understand how Salesforce works. You can, of course, develop without certification but in the long run it’s a nice move to certify all your gathered knowledge. I’m currently studying to receive a new certification. Would you say Salesforce development is a good niche for freelancers? I do think Salesforce development is an interesting role for freelancers. The fact that Salesforce is cloud-based service and that you can access it from anywhere using your credentials makes it very accessible. Even if you don’t want to use any IDE and work directly with the tools that Salesforce provides you on the platform, you can do it. There is no need to have a configured working space. Of course, there are more powerful tools to work with Salesforce than those provided by default, but it’s just to point out the incredible power of Salesforce’s accessibility. For freelancers, who really appreciate flexibility and not being tied to an office, I believe that Salesforce and their cloud tools give the perfect scenario for working from anywhere with an Internet connection. It's a role that can be 100% completed remotely and I'm an the perfect example that this is possible. I’m based in Venezuela but the company I’m working for has its headquarters in Chile. We communicate via Skype, our internal system or by e-mail, so it’s really easy and there are no problems at all. In conclusion: Is Salesforce a great career move? 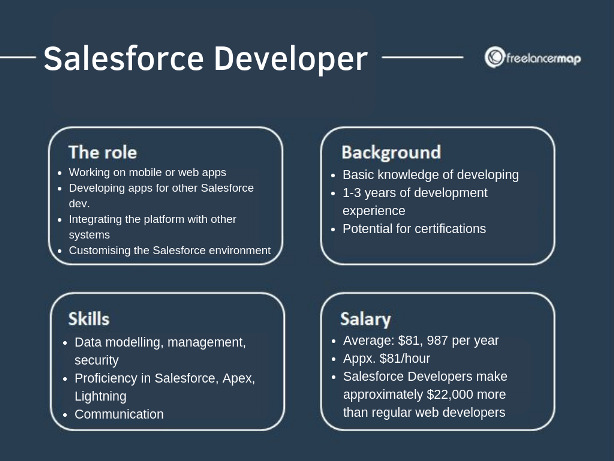 Salesforce Developers earn far more than web developers because they are in high demand. It is a skill that thousands of companies use every day; the platform has a customer base of over 150,000 companies including Facebook, Google, Twitter, and HCL. Learning Salesforce can therefore open up many opportunities in large, well-paying companies, but it is also a skill that can easily be taken up as a freelance career, and experienced Salesforce developers often enter consulting roles in the future. Salesforce is an excellent option for anyone who wishes to make a career in IT, with an easily-accessible training path and many opportunities to land high-paying clients as a freelancer.